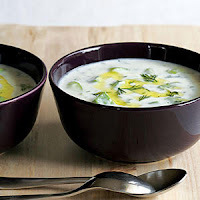 About six years ago Christine Datian had her yummy Cucumber-Avocado-Yogurt Soup recipe published in the online edition of Sunset magazine. She asked if I would post it here so you could ‘beat the heat’ of summer with this easy, no-cook dish. Enjoy this variation of traditional Armenian Jajik (chilled yogurt-cucumber soup)! Whisk together the yogurt, garlic, salt, spices, and two cups of cold water in a large bowl. Add the cucumber, avocado, mint, and dill, stirring gently to combine. Drizzle each serving with one teaspoon of olive oil. Add more yogurt or cold water, if desired.